Click on the link below to download the brightday year end accounting checklist. If you have any queries about this please contact brightday for assistance on 1800 857 680. 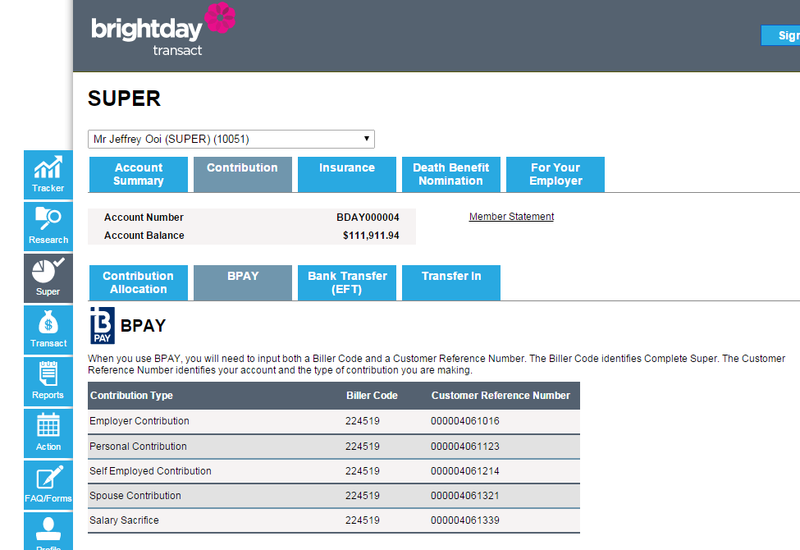 How do I /does my employer make BPAY contributions into my brightday account? Click on the "Super" tab. Click on the "Contribution" sub tab. Click on the "BPAY" sub tab. Look up the contribution type and find the corresponding Biller Code and Customer Reference Number. Look up the contribution type and find the corresponding Biller Code. Look up the member for the contribution will be made and find the the corresponding Customer Reference Number. If your employer or other party cannot pay contributions via BPAY, please contact brightday for assistance on 1800 857 680. Click on the "Action" tab. Note the Biller Code and Customer Reference Number. Send these numbers to the party making the contributions (e.g. employer) or if making the contributions yourself, enter these numbers when prompted to by your internet banking BPAY screen. How do I transfer funds in/out of my Direct Investing / Flexible SMSF account? Enter these numbers when prompted to by your internet banking BPAY screen. The funds should arrive in your cash hub by the next working day. brightday uses the bank account you nominated during the application process to transfer funds in and out of the transaction platform. If you do not have a nominated bank account or are not sure, call brightday for assistance on 1800 857 680. Click on the dashboard icon on the top right of any brightday page, you will be taken to the dashboard with your portfolio displayed. Click on the blue transact button, you will be taken to the brightday investing account. Click on "Cash Hub", an order page should pop up with the details of your nominated bank's BSB and Account number. Choose "Deposit" or "Withdrawl" specify the amount you wish to transfer and what text you want reflected on your brightday and bank statement. How do I transfer funds in/out of my Complete Super account? Select the Contribution and either of the BPAY, Bank Transfer (EFT) or Transfer in tabs below. Complete super allows customers to transfer a portion of their funds into a pension or transition to retirement (TTR) account. Please ensure that your transfer and reasons for withdrawal comply with the superannuation regulations otherwise you may be breaking the law and significant penalties may be imposed on you. If you are not sure please call brightday for assistance on 1800 857 680. In order to tranfer any amount into your TTR account you may have to sell some of your investments first to top up your cash hub balance. Click on the "Transact" tab then choose the investment(s) you wish to sell. Click on the Sell tab of the investment and sell off the appropriate amount of units to reach the amount you wish to transfer into your TTR. Your cash hub balance and available funds will be udpated once the proceeds from the sale have cleared (may take several days depending on the investment type and company). Select the Transfer in tabs, fill in the details, click on the "Print Form" button and send the paperwork to brightday. How do I set up my Complete Pension account and draw an income from it? Complete Pension customers draw their income from an existing super fund. If you haven't already set this up during the application process then proceed to the following steps: (note if you have multiple pension accounts you wish to merge you will have to rollover back to the existing super (accumulation) fund and rollover back to pension together. Call brightday support to assist you with this on 1800 857 680. Select the 'Your Pension', followed by the 'Transfer in' tabs. Select the super account you will be drawing an income from, enter in your member details and the amount of the initial transfer, click on the "Print Form" button and send the paperwork to brightday. 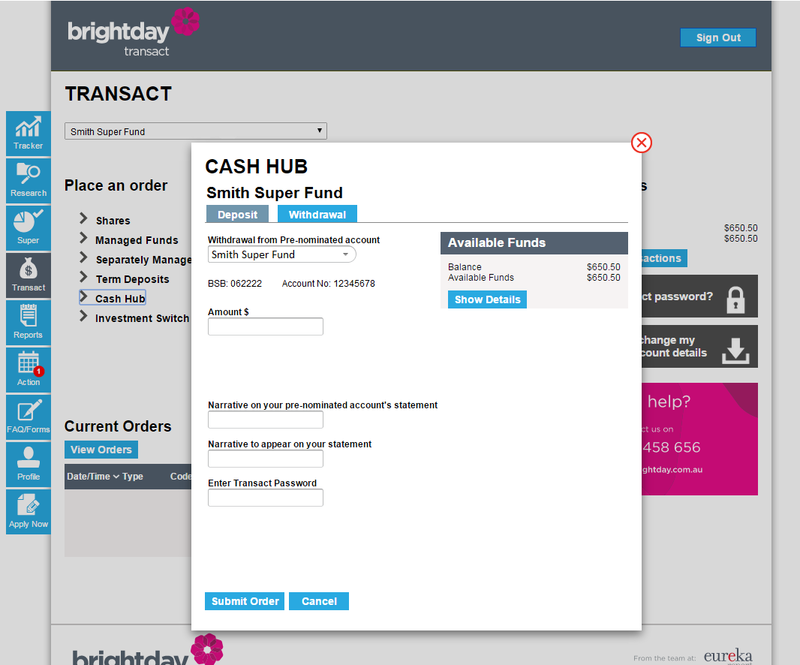 Once your super fund transfers the funds to brightday, your pension account will be credited and you will be able to setup the income amount and frequency in the 'Payment Set Up' tab. How do I transfer funds from my existing retail super fund into a brand new Total SMSF account? 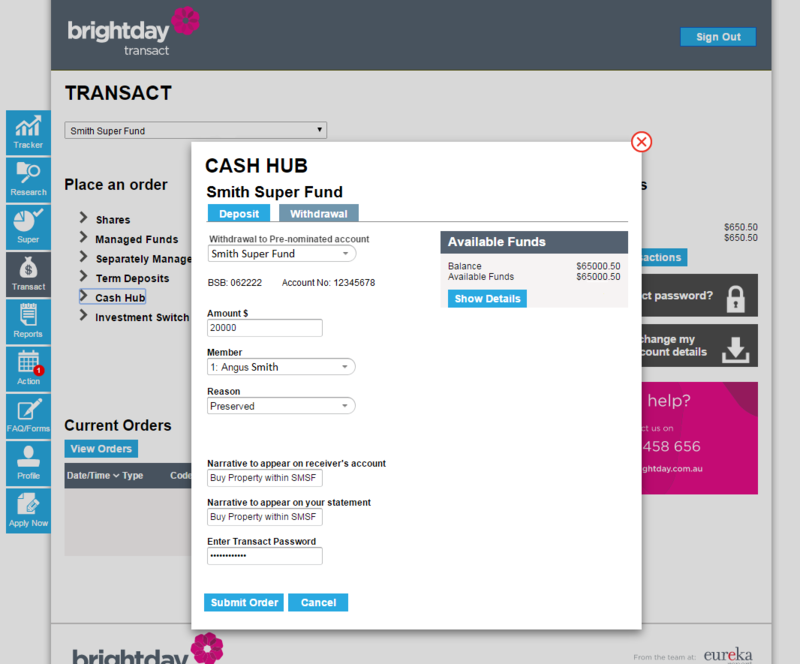 Initial funds transfer from existing retail super funds - Customers will need to complete a transfer in form to enable brightday to complete the funds transfer from your existing retail super fund. How do I transfer funds from my existing SMSF fund into my new Total SMSF account? Click on the "Transact tab" followed by the "Cash Hub" link. Click on the "Withdrawal" tab under in the Cash Hub order pad. Select your pre-nominated account in the drop down menu, enter in the amount your wish to withdraw and choose the member. Legitimate reasons are listed in the "Reason" drop down menu, if you are not sure call brightday for assistance on 1800 857 680. Enter in the text that will appear in your bank account and SMSF statements describing the reason for withdrawal. Enter in your transact password and press "Submit Order". 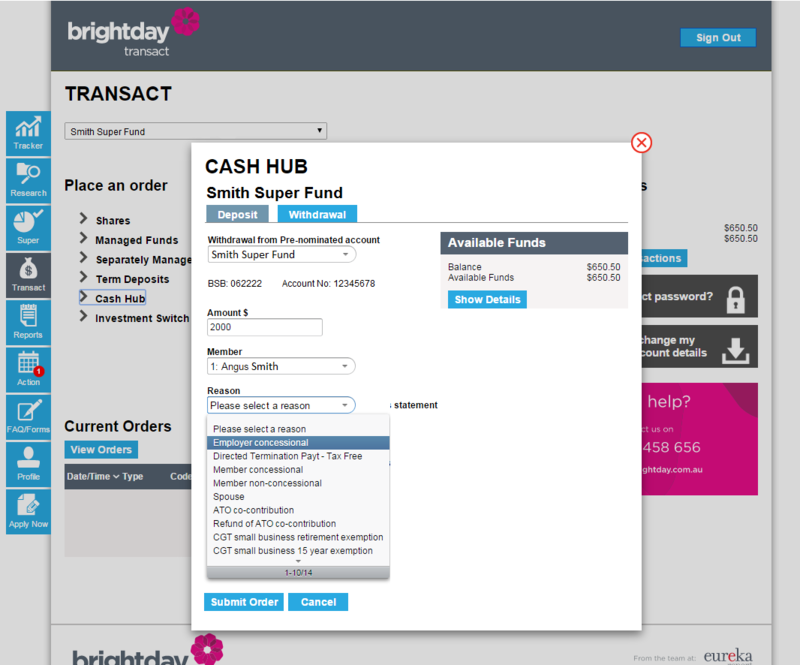 Pension payments may be made using the Cash Hub order pad (see 'Withdrawals' below) or by calling brightday on 1800 857 680 to set up a Regular Payment plan on the cash hub. Rollover: When rolling over from Total SMSF to a new fund, you will need to provide the new fund with your Total SMSF's SPIN, ABN and Fund name details. The new fund will then contact brightday and initiate the rollover. Withdrawals: Customers may withdraw funds from their SMSF provided the reason for withdraw complies with government superannuation laws such as retirement, transitioning to retirement (TTR), changed working conditions, incapacity/ill heath, financial hardship or compassionate grounds. Please ensure that your reasons for withdrawl comply with the regulations otherwise you may be breaking the law and significant penalties may be imposed on you and your self managed super fund. If you are not sure please call brightday for assistance on 1800 857 680. Click on the "Withdrawl" tab under in the Cash Hub order pad. Legitimate reasons are listed in the "Reason" drop down menu. What are brightday's SPIN, USI, ABN and SFN? You can check the current balance and asset allocation of your account by clicking on the brighday dashboard icon at the top right of any page. If you wish to check the available funds of your portfolio (i.e. the amount you can transact with), you will need to proceed to our transaction platform. You can do this by first clicking on the dashboard icon, then clicking on the blue transact button. Once within the transaction platform, you will need to click on the transact tab, and view your balance under the "Available Funds" heading. 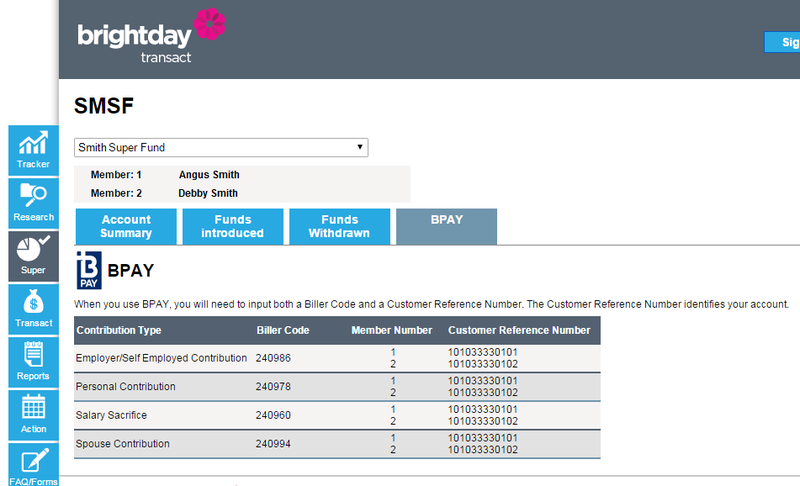 To check or update your personal details, you should log on to www.brightday.com.au go to My Account and then Edit. You can then amend your personal details as required. What Tax will I pay on Contributions? All employer contributions to your account and contributions for which a tax deduction is claimed are subject to a 15% Federal Government contributions tax. In the case of low income earners, this tax may be reduced to nil. In the case of high income earners, an additional tax of 15% may be charged. Tax on contributions is deducted at the time the contributions are made. Personal and spouse contributions that are not claimed as a tax deduction are not taxed. Personal Contributions – Generally you cannot claim a tax deduction for personal contributions if your employer makes super contributions on your behalf. Personal contributions - also known as non-concessional contributions - from your after tax income will not be taxed when contributed. These contributions are limited to $180,000 (to be indexed) per annum. If you are under 65 you are able to exhaust your non-concessional contribution cap for this financial year and bring forward a further two years worth of contributions by putting $540,000 into super. 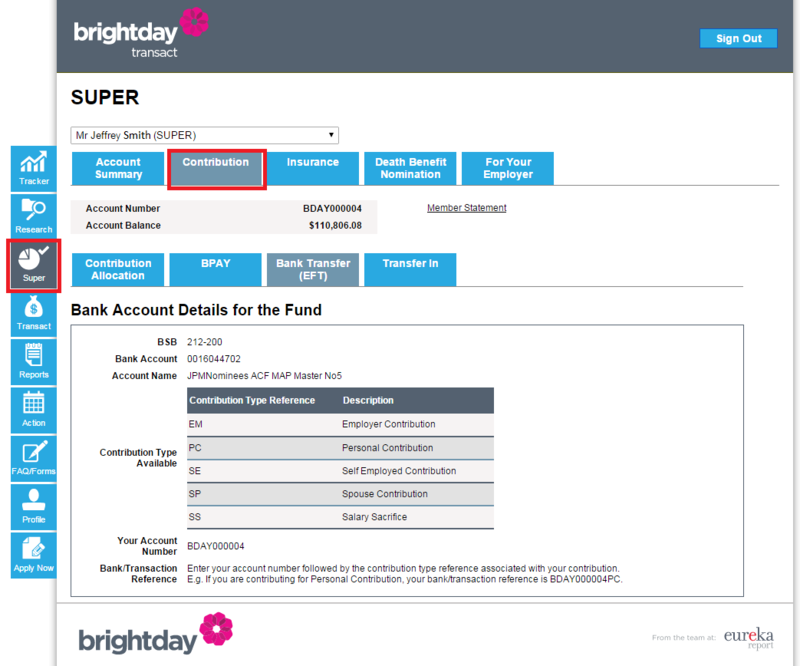 How much does a brightday Super account cost? The fees associated with your superannuation account will largely depend on which account you choose. There is no establishment fee but brightday Complete Super has fees starting at 0.69%, Total SMSF fees start from 0.50% and Direct Investing fees start from 0.50%. There are additional fees for transacting and switching. For a full guide of the fees under each option, you should refer to the relevant PDS. Does brightday have an entry or exit fee? brightday has no entry or establishment fees but there is an administration fee on exit for both total and partial withdrawals. This fee is currently $77 regardless of the withdrawal amount. What are Non-Binding and Binding Nominations? When you make a non-binding nomination, your nomination as to who should receive your death benefits when you die are a guide only and are not binding on the Trustee. The Trustee will take your death benefit nomination into consideration but it is the Trustee who makes the financial decision. The death benefit can be paid to your dependents or your legal personal representative of your estate. If you nominate on your form someone other than those people listed as a dependent, your nomination will be invalid. Your binding nomination will only remain valid for three years. After this time you will need to re-confirm the nomination or provide a new one. In the event that your nomination becomes invalid, the conditions applying to non-binding nominations apply. Where do I send my application forms and other supporting forms? 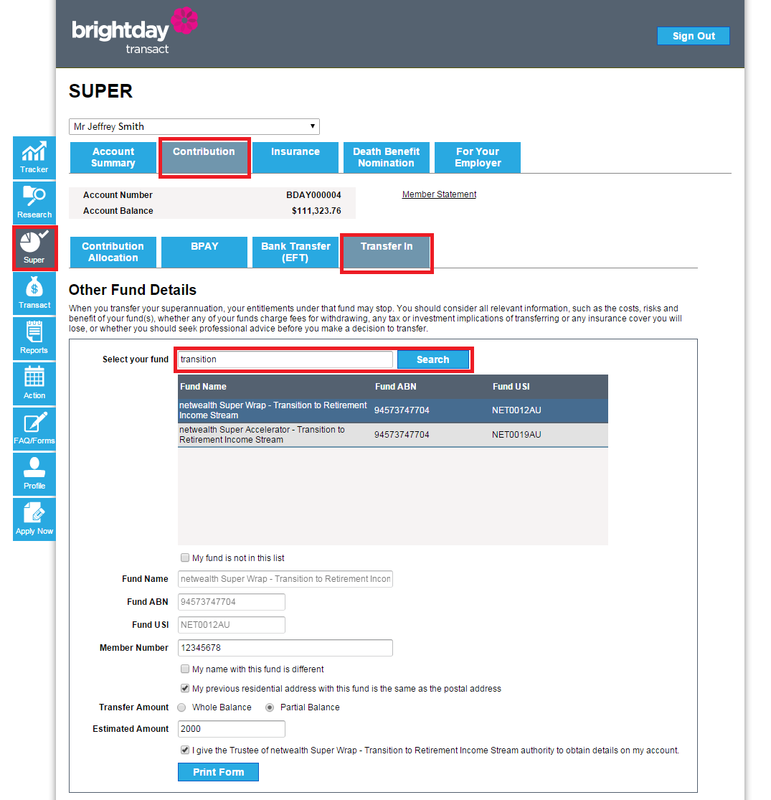 A letter of compliance tells your employer that brightday Complete Super is a regulated super fund. You will need to provide one to your employer when you ask them to pay your super into brightday Complete Super. How do I make extra contributions to my super? Salary sacrifice is adding to your super from your before tax salary. Salary sacrifice is an arrangement you set up through your employer where rather than receive part of your income as salary and wages, your employer will make an equivalent contribution to your super fund on your behalf. The sacrificed amount is paid directly into your brightday Complete Super account before income tax is deducted. This then reduces your gross salary or wage for taxation purposes. To access your super, you generally need to have permanently retired from work and have reached your preservation age. Your Preservation Age is dependent upon your date of birth. Do I have to pay tax on lump sum withdrawals? Super withdrawal benefits paid in cash from a taxed fund will generally be tax-free for those aged 60 or over. This includes both lump-sum and pension payments. For those aged under 60 years and who are eligible to receive their benefit, the tax treatment of lump-sum withdrawals is divided into tax-free and taxable component. What are the investment management costs? All fees are fully disclosed in the PDS. There are a range of fees payable which are based on the investment options you have chosen. These fees may range from 0.69% through to 0.95%. Insurance premiums will be based upon your age and other factors related to the risk of providing insurance. These premiums may vary due to a range of factors but you will be advised of this before you purchase your cover. When are the investment management costs deducted from my account? All investment management fees are calculated daily and deducted monthly. brightday has a number of investment options available for your consideration. These options include ready-made portfolios with a pre-set asset allocation and wide list of approved options where you can mix and match, as you wish. When considering what the right mix is for you, you should read the Product Disclosure Statement (PDS) carefully before you decide. The PDS is an important document and you should consider it carefully. Can I change investment options? Yes. You can change your investment options but you should be aware that there is an administration fee to do so. In some cases, making an asset allocation decision may also result in a taxable event. When will the switch be processed? Any investment change that you make will be acted on promptly. When will I see the switch on my account? Once the switch has taken place it will be reflected in your account. What if I do not make an investment choice? What is the default investment strategy? brightday is a self-directed superannuation and investment offering. Because of this, you will have to decide on an investment strategy that is right for you. brightday offers a comprehensive range of information designed to help you to determine the right investment strategy for you. Your insurance needs will be determined by a number of different factors. Try this insurance calculator to help you determine your needs. Your insurance cover will apply only after you have been underwritten by the insurance company, your premium has been paid and you have received your policy document. Interim cover may be applicable whilst you are going through the underwriting and assessment process. What happens to my insurance if I go on leave? Once you have been underwritten by the insurance company and you have commenced paying your premiums, your cover will generally remain in place. If you go on leave, your cover will remain in place provided you continue to pay your insurance premiums at they fall due. You should read your policy document carefully to ensure that your insurance cover provides for you if you are overseas. How do I change my insurance cover? If you wish to alter your insurance cover, you are altering a contract between you and the insurer. For some defined events, the insurance company may allow you to increase your cover without medical evidence. In other cases, a rise in cover may mean that you need to provide further medical evidence before the life company will allow an increase in cover. You should refer to the Product Disclosure Statement (PDS) for more detailed information. Yes, you may increase your level of insurance cover subject to the terms and conditions requested by the insurance company. Please refer to the PDS for more detailed information. Can I cancel my insurance cover? Yes, you can cancel your insurance cover at any time by formally notifying the insurance company that you wish to stop your payments and cease cover. Before doing so, you should think carefully about your decision. Ceasing cover before having other insurance in place may mean that you are uninsured. In addition, if your health has altered, you may not be able to be underwritten or may have to pay an increased premium. What are the maximum levels of insurance cover? The maximum level of insurance cover will depend upon which insurer and contract you have in place. You should refer to the relevant PDS to establish these maximums. How do I pay my insurance cover? The insurance company providing your insurance will advise brightday of your insurance cover and premium costs. This premium will be deducted from your fund balance and remitted to the relevant life company on a regular basis. As long as you have enough funds to pay the insurance premium, your cover will generally remain in place. When are the insurance premiums deducted from my account? Insurance premiums will be deducted from your fund balance on a pre-determined basis between brightday and your insurer. This may be monthly, but it may be quarterly or annually depending upon the life company providing the life insurance cover. How do pension accounts work? Do I have to be retired to open a pension account? If you are over 65 or over, you can continue to work full time, or part time, and open a pension account using your superannuation. If you have not retired and you are between 55 and 65 years of age, you can also open a pension account using a Transition to Retirement (TTR) strategy. What is a Transition to Retirement (TTR) strategy ? If you've reached your preservation age and you're still working you may be able to access your super to start a transition to retirement (TTR) strategy. This allows you to gain limited access to your superannuation by commencing a ‘transition to retirement pension’. This pension is similar to a normal account based pension, however, superannuation rules stipulate that you may only withdraw up to 10% (min 4%) of your pension balance in each financial year. In order to begin TTR you must have a pension account set up within your SMSF, or as a separate account such as brightday's Complete Pension. If you are entering pension phase, the first thing you will need to consider is how much income you will need and how often. If you haven't considered this yet, we recommend you call brightday on 1800 857 680 to discuss your options. How does a Transition to Retirement (TTR) strategy differ to a pension account? The maximum amount you can receive as a pension payment in any one financial year is limited to 10% of your account balance. These restrictions apply until the member permanently retires, changes employment on or after age 60, or reaches age 65. What is the Government Age Pension? The Government age pension is a regular periodic payment made by the Government that may supplement your super and any other investment income you may have in retirement. To receive the Government Age Pension you must meet certain eligibility criteria. This criterion includes age, income and asset thresholds. How much is the Government Pension? What is the Age Test? The age test is one of the tests that will be applied to determine whether you are eligible for the Government Age Pension. The Income Test is one of the tests that will be applied to determine whether you are eligible for the Government Age Pension. The amount of income you and your partner receive may affect the amount of your Government Age Pension. What is the Age Assets Test? The Assets Test is one of the tests that will be applied to determine whether you are eligible for the Government Age Pension. The Assets Test is based on the value of any assessable assets you own. The work test applies to people aged 65 to 74 years who want to contribute to their super. To be eligible to make contributions to your super if you are aged 65 to 74, you must have worked for at least 40 hours over 30 consecutive days in the financial year you wish to make a contribution. You can make any type of contributions to super to the age of 75, if eligible. There is no upper age limit for SG (Superannuation Guarantee) contributions. If you are working, and eligible, your employer is obligated to make the payment. How do I get my Centrelink Schedule? brightday will provide Centrelink (and/or Department of Veterans Affairs) with a Centrelink Schedule in March and September each year. What kind of supporting documents are required when opening an account with brightday? If you don’t have a valid driver’s licence, you must provide a certified copy of a current item from list A and a certified copy of an item from list B. How do I certify supporting documents when opening an account with brightday? A certified copy of a document is a copy which has been certified as being a true and accurate copy of the original by an authorised person such as a financial adviser who has held an AFSL for two or more continuous years, or a judge, magistrate, Justice of the Peace, lawyer or chartered accountant. An individual who, in relation to the Aboriginal community is recognised to be a community elder or is an elected member of the community council. 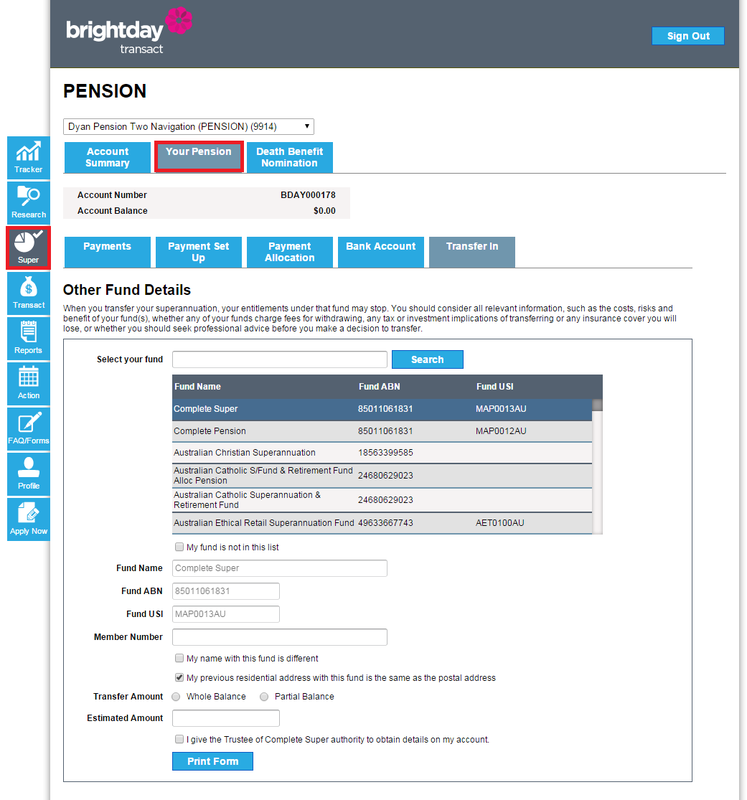 To open a brightday Pension Account, go to Apply and then select Complete Pension application. The application process will allow for you to roll your superannuation monies directly into the pension. How much can I receive as a regular pension payment? There is a minimum amount that must be withdrawn from your pension accumulation balance each year. This minimum is required by law. The minimum amount is a percentage of your account balance determined by your age. Only retirement income accounts using the Transition to Retirement Strategy have a maximum amount that can be withdrawn. The maximum amount is 10% of your account balance. When you first open your pension account you will be asked to decide how much you wish to receive. This must be above the minimum limit and below the maximum limit if you are opening an account using a Transition to Retirement Strategy. Your minimum and maximum payment amounts will change on 1 July every year. How do I calculate my minimum payments if I start my pension account after 1 July? If you start receiving your retirement income payments on a date other than 1 July, the minimum and maximum limits are pro-rated for the number of days in the financial year that are left, including the day that the pension starts. E.g. if you start a pension on 1 January, and your super balance is $200,000 and your minimum pension is 4% of your balance, then $200,000 x 4% x .5 or $4000 must be paid out as a minimum pension up until 30 June. What is my payment factor? The payment factor is a percentage used to determine the minimum payment amount for a pension account required by law. The minimum payment amount is your account balance at 1 July (or account balance when you first set up your account for that financial year) multiplied by the payment factor for your age at 1 July. Please refer to the table below for your payment factors by age group and the 2014/15 percentage. How is my pension payment paid to me? Your regular pension payments and any lump sum withdrawals will be made directly to your nominated bank account. Pension payments may be scheduled to take place monthly, quarterly, bi annually or annually. Can I add to my pension account? If you would like to add to your pension account (for example money from an inheritance) you need to deposit the money into a super account first. Once you have deposited your cash into a super account, you will need to open a pension account and combine your super account and your existing income account into it. What are Non-Binding & Binding Nominations? Nominations can only be made on a Binding Death Benefit Nomination Form. The only beneficiaries that can be nominated are your dependents or your legal personal representative (that is the executor or administrator of your estate). Your Binding Death Benefit Nomination form must be signed by you and two witnesses, both of whom must be at least 18 years old and not nominated as beneficiaries of your Death Insurance Benefit. If you nominate someone other than those people listed as a dependent, your nomination will be invalid. Your binding nomination will only remain valid for three years. After this time you will need to re-confirm the nomination, or provide a new one. In the event that your nomination becomes invalid, the conditions applying to non-binding nominations apply. In the first instance, please call brightday on 1800 857 680, weekdays 8.30am - 5.30pm (AEST) to discuss your complaint with our Client Services Team. The complaints officer will ensure that your complaint is investigated fully and you will be provided with a written response. You will be provided with a written acknowledgement of receipt of your complaint within 7 days. You may be eligible to take your complaint to FOS if you do not receive a response to your complaint within 45 days or are not satisfied with the response provided after going through brightday’s internal complaint process.